That’s the opening sentence from Michael Mondavi’s forward to this handsome book, a piece of advice he says he first heard back in 1966 when he and his father Robert were barely getting started with their winery. That thought is reinforced throughout this fine survey of recent wine label design. The author, Tanya Scholes, is a floral designer who spent many years in the advertising and design industry. While her book is not an exhaustive overview of wine labels, it may be the most comprehensive look at their design that’s yet been published. Covering label designs from well over 200 producers around the world, the book includes lots of excellent color reproductions. As the book title suggests, the focus is mainly on labels designed in recent years, though a few “classics” are included as well. Between Mondavi’s forward and Scholes’ two short sections that follow – “A Brief History of Wine Labels” and “Wine Labels Today” – we gain insight into the process of wine label design and how the function of labels has developed over the years. Wine labels as we know them today are probably less than 200 years old, and the label has evolved from a simple and utilitarian piece of information to become a “piece of visual culture,” as Scholes puts it. 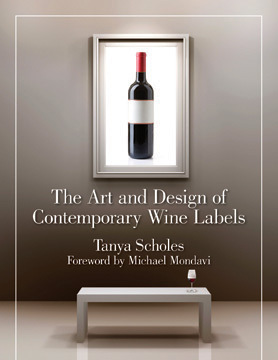 She notes that labels are now designed to be a “voice for the wine,” and a prominent quote describes them as a “window to a wine’s story” – two ideas that are echoed throughout the book. With this background information in mind, the heart of the book begins, with one- or two-page entries for each producer, all including one or more labels. For each producer, Scholes provides a lively profile of the key personalities behind the wine along with witty stories about the label artwork. And for each of the color label illustrations, there is information on the wine and the label designer. Many pages also highlight perceptive quotes from the winery owner or label designer. The writing really expands how we see the labels and how they are intended to connect with potential consumers. It might have been useful to include price points for the wines whose labels are depicted – that would give us more of a clue as to the intended market and how certain types of label design may be aimed at particular segments of the market. An index of label designers would have been helpful as well, but these are minor nit-picks in what is overall an impressive work. The labels included in the book tend toward designs with bold graphics, and many are quite striking in their imagery. You could say that these are not your father’s wine labels! They’re designed to grab your attention, say something to you, and then tempt you to learn more. While a number of the labels depicted would fall under the “whimsical” category, many others are in a more serious vein, and clearly aspire to more than just catching the eye. Many of the best don’t reveal everything at first glance, but reward a thoughtful analysis. All of the labels offer something of interest in their use of text and typography, graphics, color, and composition. This is a book that will appeal to both wine-lovers with an interest in graphic design as well as to those interested in wine marketing. At $45, it’s not inexpensive, but with the beautifully-reproduced artwork and large 8½x11 format, it should be a real conversation-starter on anyone’s coffee table. The depth of information provided makes this is a book to come back to, enjoy, and learn from. It certainly has me thinking about wine labels differently than I did before.